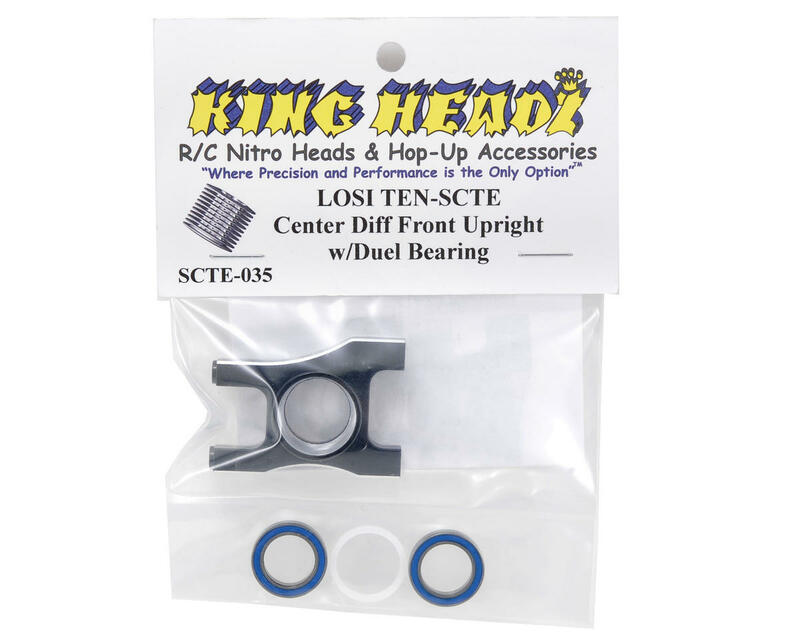 This is an optional King Headz Center Differential Front Upright, and is intended for use with the Losi TEN-SCTE. 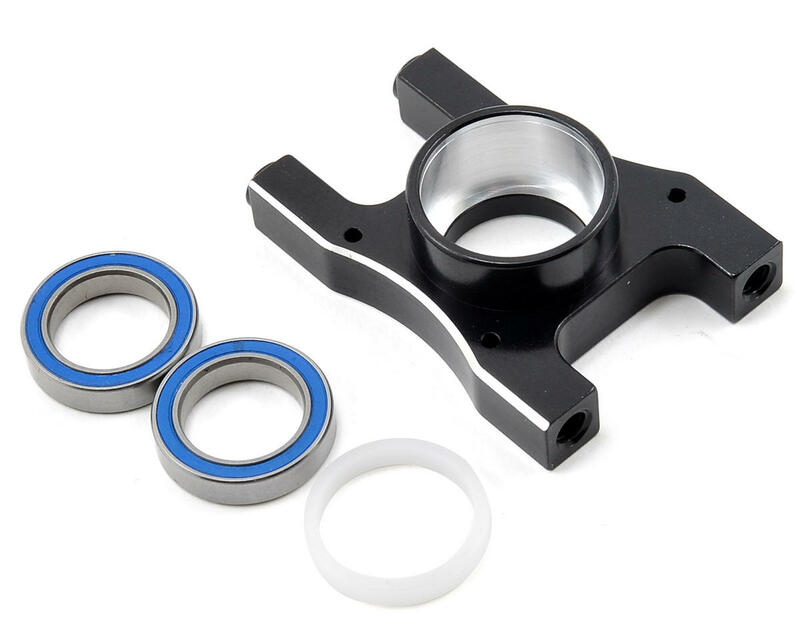 This Center Differential Front Upright uses two 12x18x4mm bearings instead of one single bearing, virtually eliminating the outdrive wobble and allowing the front drive shaft to spin true and smooth. It has been CNC machined from 7075 aircraft grade aluminum and anodized black for durability and good looks. A must have for your SCTE along with the other center diff parts they make with dual bearing on the other side as well which is incorporated with the motor mount. A top plate is made by them as well which adds more rigidity to the entire center diff assembly. Along with their aftermarket chassis which reduces the angle of the front drive shaft, it greatly reduces the wear on it as well. All are well made and precision machined unlike many other companies where close tolerances are not kept. Overall the entire setup greatly increases the life of the drivetrain, and they make many other parts which are upgrades for the SCTE as well. Very high quality mount. Now I shouldn't get much slop due to the front outdrive actually riding in a bearing. I am using this mount with the lightened losi lightened outdrives and tekno center shafts. One of the best investments you can make on your SCTE. There is absolutely no slop in the diff anymore. Very high quality. I bought the King Headz diff front upright, motor mount, center diff top plate, and the steering too plate and all are top notch! They make the whole system more strong and solid. All these King Headz parts are a great investment that I would highly recommend! Super product! Reduces wobble, noise. Highly recommended. With the KHZ motormount even better. Of all my upgrades, this along with the kingheadz motor mount has made the most noticable difference. The drive shafts are much tighter and run so much smoother. I'm getting double the life out of my drive shafts and I'm getting more power to my wheels. This is a must upgrade for any SCTE owner!! 5 stars!!! Reduces wobble and binding. There is some extra weigtht due to the aluminum and the extra bearing and insert. What you gain is durability and stiffness. Also don't forge that you can loctite this into the chassis, which prevents the upright from coming loose. I gave this 5 stars, because, with this vs. the stock upright, I would have the confidence to have a carbon fiber top plate, but not without this upgrade. Compulsory tuning necessary tuning on SCTE ? great frame, double bearing does its work at height, no vibrations of the cardan shaft and differential , is Very necessary and useful thing --- I recommend that Russia is estimated at 5 this tuning !! !